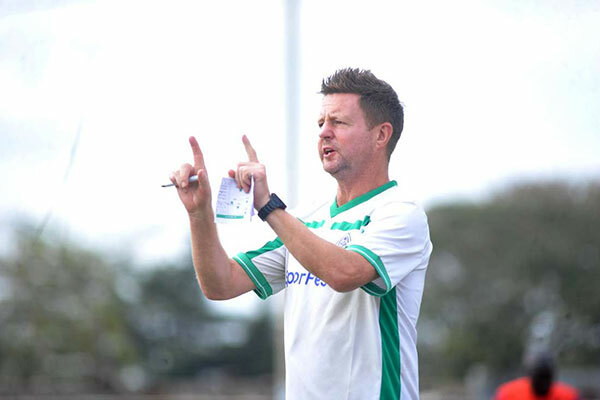 Gor Mahia coach Dylan Kerr has suggested that FKF chair Nick Mwendwa deliberately scheduled the Shield match against Kariobangi Sharks too close to Gor Mahia’s arrival from Algeria. Gor Mahia did not have any time to hold a training session before the match and had not recovered from jet lag. In another tweet, Kett commended his players for playing well under difficult circumstances. The players for their part are also highly appreciative of the work Dylan Kerr has done. “I would Iike to thank the coach for the relationship, courage and trust he has shown to the players. He has given each and every player an opportunity to showcase his ability – may God bless him,’’ said Innocent Wafula who has skippered the side in some matches this season. The coach has a point regarding this shield cup fixture. It would be interesting to hear what Nick Mwendwa would say. As for the KPL fixture congestion, I think KPL is solely responsible for running the Kenya Premier League and the Chairman of KPL is none other than Mr. Ambrose Rachier who happens to be the chairman of the team whose coach had been appealing for rescheduling some of those matches. In all fairness, if fixtures were to be decongested, then it was within the capacity and means of Mr. Ambrose Rachier to do so. One wonders why he chose not to, despite the passionate pleas from his coach, his players and even the fans of the team he chairs. However, now that is all water under the bridge. We should now just concentrate on correcting the emerging weaknesses in the playing unit and trying out the corrections in the six remaining league matches. If the coach has realized that Blackberry is not the same again since Walusimbi left, this is the right time to re-program Blackberry and bring the best out of him as an independent player. The coach has enough work in his in-tray just in case he had not realized. He should use this time to get the best out of the rarely used players like Stephen Okiro Onyango. Kerr has become the whining coach NOT the winning coach that he used to be….isn’t that the reason why clubs have a squad of 30 players to choose/rotate from unless you are telling us that you have a weak squad ? I would like to assume that Gor Mahia has a serious African agenda(Plan). The problem with Gor is planning vs a vis club resources vis a vis conflicting interests. All these tournaments CafCC, Shield, Sportspesa, Kpl, East n Central were running concurrently. Take the Sportpesa cup, of what value is it to Gor? European clubs do take part in their respective “sponsor” tournaments but they are well planned e.g. the Emirates cup of which I cannot tell who the current champions are, or wether it was held or even where it was held and this is coz nobody cares. Sportpesa should have only invited the clubs it’s sponsors. Hijacking East an Central thru’ the back door is not the way to go. Sportpesa disrupted the league fixtures. Gor had to pacify it’s donors by taking part. But look at the repercussions!! How do you turn around and complain about congestion. Where was the Tech bench to give advice. The truth is that both coach and EC wanted these tournaments but for conflicting reasons. The coach was out for his glory and the EC was out to fill it’s pockets. By the time East and central was starting the rot had began. Players realized that they were simply being used. So now your going to play Everton, a club that is also in contention simply to patronize the sponsor. East and Central was once prestigious but one N.Musonye has put paid to that. His business acumen is almost zero and his best noticeable attributes are the words “get lost” and “we do not care”. Sportpesa should work with East n Central if they really care about soccer. Why does Sportpesa make demands for an extra tournament without taking into consideration the welfare of the players it claims to care about? Gor did not look at the welfare of it’s players when entering these tournaments. Arrogance and negligence became EC trademark. Gor EC has been a big letdown. The club should look at it’s five year plan or come up with one if none exists. Serious scouts pay attention to Cafcc or Cafcl. By skipping the East n Central Rayon made one big catch. Nick Mwendwa is also a competitor. What was Gor expecting out of him? Why should Mwendwa postpond a match just becasue Gor EC cannot manage their travel plans… and is Kerr telling us that Gor would beat Esperance simply coz they missed a training session after landing. Competition means taking advantage of your opponents weakness and in some cases creating one for him. Its the best prepared team that wins not the best players. Gor Mahia has had a steep learning carve in the recent past, lets see how 2019 goes. For the coach, he still has my support. Kerr and the playing unit have fone well. if only Gor was well managed..we would still be celebrating. our EC is not proffesional at all. Me am already closed shop for the seasonas far as Kpl is concerned. My only plea to Kerr is not to let GM embarass Kenya in Goodison Park please. Everton are in session now and not pre-season meaning they are fully fit and rearing to go. We will meet them in btn their games and 3 days to a crucial one for that matter meaning they will field their best 11and use the game for preparation. That is where mediocrity of GM midfield with no number 6 and 8 coupled with a blundering erratic defense line will be showcased for the world to see. Being outplayed and pumped 8 goals is something that will Ruin brand K’Ogalo worldwide especially going there under the Banner KPL Defending Champions. Kerr start training early with tactics that can work and a display that will earn us Respect like the 2-1 loss in TZ last year. British Media is the worstvand Yuora Nena type of football will earn condemnation of untold proportions. I still value and trust the Coach and TB while EC is just that…Corrupt and Inept always so i wont speak of them. It is true that some players combine so well such that without the other, ones efficiency depreciates. I recall 1997 when Peter Ochieng Dawo “Omuga” scored most of his goals using his head, courtesy of heading crosses from Sammy Onyango “Jogoo” . When Kenya Post office insisted that all footballers working for them must play for Kisumu Posta and Sammy Onyango “Jogoo” left Gor Mahia, Peter Dawo was negatively affected because he could no longer get the crosses he used to get from the left wing as Sammy Onyango “Jogoo” used to do. Now that we have learnt where things went wrong as Gor Mahia, let the coaches start scouting for players to recruit during the transfer period in readiness for the next season. Let us also select tournaments to participate in, participating in all tournaments like CECAFA club championship also exhausted our players. I don’t want to imagine what Everton will do to us in Goodison going by the kind of display I saw in Algiers.God shield us from the impending merciless beating. @Odhis Muga, be objective but not negative. Go and support Everton and Ingwe we can loan you out. @Janam, you do not have technical know how on which players to be dropped. Your work as a fan is to support whoever is fielded by the coach and anything else is wishful thinking. Janam I don’t agree with you.thank goodness you are not the person who decides which player is to be dropped!! Coach, stop giving excuses; you had the option of choosing which tournament to play in! Jasego one thing the team definitely has to do is to get a goalkeeping coach, period. We lost very critical games because of poor goalkeeping. This department need s a top class coach in this current football era. Not any other ‘wat jakom’. Goal keepers let us down at times of need. W have a very talented young keeper who should not waste his time in that area if the coach is equally poor. Ama ni tano tena jameni? Change is required.